American Humanics is a national alliance of nonprofits, universities and colleges dedicated to educating, preparing and certifying professionals to strengthen and lead nonprofit organizations. Including certification and a minor degree, the American Humanics program is an innovative course of study that equips students to become skilled professionals and leaders in America's nonprofit organizations. To ensure success, American Humanics provides leadership opportunities, internships, and scholarships as well as education curriculum. Headquartered in Kansas City, Missouri, American Humanics is the only national nonprofit organization meeting this need. Darian Rodriguez Heyman (San Francisco, CA) has been working to enable nonprofit leaders for over a decade. For the past five years, he served as Executive Director of Craigslist Foundation, where he was instrumental in conceiving, executing and promoting its acclaimed Nonprofit Boot Camp conference series. Over 10,000 graduates attended the program during Heyman’s tenure, and approval ratings never dipped below 93%. Heyman developed Boot Camp into the largest nonprofit gathering in the San Francisco Bay Area and it has held that honor for four years running. He also successfully expanded the program into New York City, and he has served as MC for every conference to date, building his name as a public speaker and a central figure in the sector. Heyman’s collaborative approach to producing nonprofit conferences is unique, in that he recruited over 200 local nonprofit capacity building and technical assistance organizations to plan the content and promote the conferences. This is partly why the Boot Camps have featured some of the most respected experts in the field as presenters, many of whom will be recruited as authors for the book. Heyman has moved on from Craigslist Foundation and continues to keynote and speak at major conferences around the country (i.e. Independent Sector, BoardSource, NTEN, Grantmakers for Effective Organizations/GEO, Nonprofit Congress, CompassPoint’s Nonprofit Day, and various state associations of nonprofits). The media also frequently taps him for his insight, and his comments have appeared in the New York Times, the San Francisco Chronicle, and the Chronicle of Philanthropy. For his work in the field, Independent Sector has gone as far as labeling him a "Vital Voice" in their 2007 Annual Report. Heyman has also been appointed as a Commissioner for the Environment in the City and County of San Francisco by Mayor Gavin Newsom, and as a Senior Advisor to the United Nations’ Global Alliance for ICT and Development, further establishing his credibility. Foreword (Ami Dar, Idealist.org/Action Without Borders). About the Book (Darian Rodriguez Heyman). Part One The Big Picture—What the Field Is All About and Where You Fit In (Darian Rodriguez Heyman). Chapter 1 The Role of Nonprofits in American Life (Robert Glavin, MNA, University of San Francisco). Chapter 2 Welcome to the Movement (Paul Hawken, OneSun Solar). Chapter 3 On Leadership in the Nonprofit Sector (Emmett Carson, PhD, Silicon Valley Community Foundation). Chapter 4 Taking Charge of Your Nonprofit Sector Career (Shelly Cryer, Consultant, and Kim Hendler, iMentor). Part Two Managing Organizations and People (Darian Rodriguez Heyman). Chapter 5 Strategy and Planning: Turning a Dream into Reality (Jeanne Bell, MNA, CompassPoint Nonprofit Services). Chapter 6 Strategic Restructuring: Collaboration, Alliances, and Mergers (David La Piana and Bob Harington, La Piana Consulting). Chapter 7 Risk Management and Insurance (Pamela Davis, Nonprofits Insurance Alliance Group). Chapter 8 Making Human Resources Work for You: Best Practices in Nonprofit Human Capital Management (James Weinberg and Cassie Scarano, Commongood Careers). Chapter 9 The Importance of Diversity (Michael Watson, Girl Scouts of the USA). Chapter 10 Bridging the Generation Gap (Peter Brinckerhoff, Corporate Alternatives, and Vincent Hyman, Vincent Hyman Editorial Services). Part Three Nonprofit Law and Finance (Darian Rodriguez Heyman). 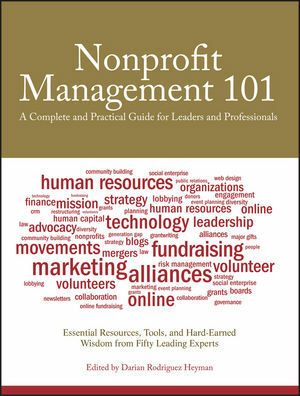 Chapter 11 Nonprofit Law (Bruce Hopkins and Virginia Gross, Polsinelli Shughart). Chapter 12 Nonprofit Advocacy and Lobbying (Nayantara Mehta, Alliance for Justice, Nancy Chen, Neighborhood Legal Services of Los Angeles, Marica Avner and Jeannie Fox, Minnesota Council of Nonprofits). Chapter 13 Nonprofit Financial Management (David Greco, Nonprofit Finance Fund). Part Four Nonprofit Technology and IT (Darian Rodriguez Heyman). Chapter 14 The Technology Foundation: Hardware and Software (Holly Ross, NTEN: The Nonprofit Technology Network). Chapter 15 Cooperative Approach to Web Design (Elliot Harmon, TechSoup Global). Chapter 16 Online Community Building: How to Wire a Network to Support Your Nonprofit's Mission (Jon Warnow and Joe Solomon, 350.org). Chapter 17 Constituent Relationship Management (Steve Wright, Grameen Foundation). Part Five Fundraising (Darian Rodriguez Heyman). Chapter 18 Fundraising: Knowing When to Do What (Andrea McManus, CFRE, The Development Group and The Association of Fundraising Professionals). Chapter 19 Individual Donor and Major Gift Strategies: The 83% Solution to Fundraising (Kay Sprinkel Grace, CFRE, Transforming Philanthropy, LLC). Chapter 20 How to Seek a Grant (Tori O'Neal-McElrath, Center for Community Change). Chapter 21 Online Fundraising (Katya Andresen and Rebecca Higman, Network for Good). Chapter 22 Online Peer-to-Peer Fundraising (Nicci Noble, CFRE, Noble Services, and Sean Sullivan, Center for Environmental Health). Chapter 23 Cause-Related Marketing (Jay Aldous, Social Capital Partnerships). Chapter 24 Social Enterprise 101: An Overview of the Basic Principles (Rick Aubry, PhD, New Foundry Ventures and Stanford University Graduate School of Business). Part Six Marketing and Communications (Darian Rodriguez Heyman). Chapter 25 Nonprofit Marketing (Jennie Winton and Zach Hochstadt, Mission Minded). Chapter 26 Using Web 2.0 Tools to Tell your Organization’s Story: Blogs, Flickr, and YouTube (Beth Kanter, Zoetica). Chapter 27 Crafting an Effective Newsletter Strategy (Kivi Leroux Miller, NonprofitMarketingGuide.com). Chapter 28 Painless and Effective Event Planning: Let's Get This Party Started! (Marika Holmgren, Organic Events). Chapter 29 Public Relations for Nonprofits: Getting Ink for Your Cause (David Fenton and Lisa Chen, Fenton). Part Seven Boards and Volunteers (Darian Rodriguez Heyman). Chapter 30 Board Governance (Emily Heard and Vernetta Walker, BoardSource). Chapter 31 Getting Your Board to Fundraise (Bob Zimmerman, Zimmerman Lehman). Chapter 32 Volunteer Recruitment (Greg Baldwin, VolunteerMatch). Chapter 33 Volunteer Engagement and Management (Michelle Nunn, HandsOn Network). Closing Thoughts (Darian Rodriguez Heyman). Afterword (Lynne Twist, Soul of Money Institute and The Pachamama Alliance).